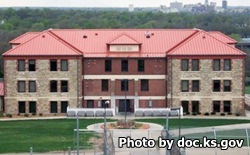 Topeka Correctional Facility is located in Shawnee County Kansas. It is a state prison that houses women. Due to the fact that it is the only facility in the state that houses females, it also has all custody levels of inmates from maximum to minimum/work release. It currently is at capacity housing over 764 adult females. In 2012 the Department of Justice concluded an investigation into ongoing sexual abuse and misconduct claims that surround this facility, finding that the facility failed to protect the female prisoners from a variety of constitutional rights violations. At one point a female inmate was even impregnated by a member of the male staff. The facility has since made sweeping changes reassigning the facility administrator and undergoing several audits. Visiting at Topeka Correctional Facility is on Saturdays from 8:30am-3:30pm and Sundays from 9:30am-3:30pm. You must arrive at the facility by 2:30pm or you will not be allowed to enter into the prison. Outdoor visitation is for incentive level III inmates only and is from April 1st to October 31st, 8am-3:30pm.